Well, you should know the rest and if you don’t your children do! Your family might be familiar with some of these old school characters like R2-D2, Princess Leia, Luke Skywalker, Han Solo and of course Chewie. Or maybe your family is a bit more fond of following the prequels with Anakin Skywalker, Obi-Wan and Padme. Or maybe they’re die-hard Yoda fans and talk like this, they do. Whether it’s the classics or the recent releases almost every parent and family is familiar with Star Wars. No matter who or where your favorites fall on the Star Wars movie timeline, we’ve got your top-rated, highest in demand toys and games from Endor to Tatooine. Whether your part of the Resistance or not your child will love any of our toys below! May the force be with you and yours in all of your playtime adventures. This page has been updated and each product has been reviewed. During the review each product has been closely examxed to make sure it meets the criteria of the website then updated with the new format. One of the most lovable characters of the Star Wars franchise is Chewbacca, whom Han Solo fondly calls Chewie. He happens to be the epitome of what a best friend should be: ever-supportive, loyal, and will defend our hero through thick and thin. It is perhaps for this very same reason that many kids consider the Star Wars The Force Awakens Chewbacca Electronic Mask as their chance to take on the role of this venerable character. What makes this mask really fantastic is that it comes with built-in miniature animatronics, complete with a roar that is guaranteed to echo across the Universe. Built in amazing physical detail, the Chewbacca Electronic Mask produces high quality sound, recreating the symphonic balance of our Wookie warrior’s temper and the Millennium Falcon co-pilot’s big-hearted nature. 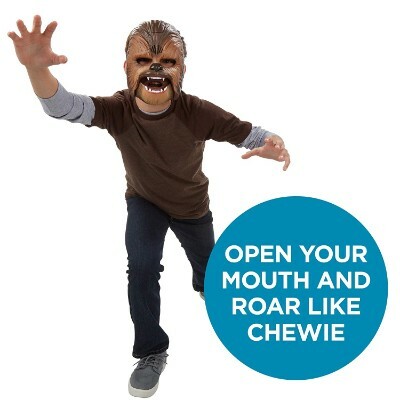 The Chewie mask comes with fully adjustable straps to optimize comfort fit while kids go about roaring through the Galaxy and beyond. Not only does this mask resemble Chewbacca in a scarily real way, it’s also hilarious. 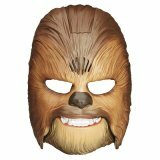 Whether you’re purchasing this mask as a joke, a Halloween costume, or just because your kids love Chewbacca, it’s frighteningly realistic. Between his deep growls and furry-looking face, kids will have a serious laugh with it -- But so will adults! 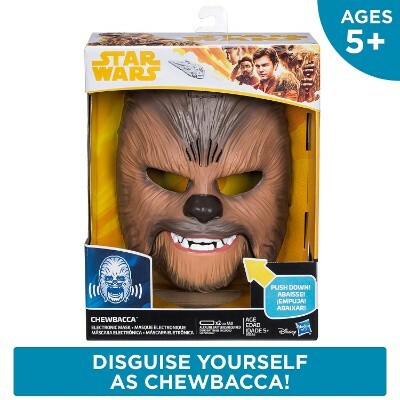 The Chewbacca Electronic Mask’s superb attention to detail and supremely realistic roaring sound effects make it an amazing prop for children’s role playing activities, enhancing the various cognitive abilities of kids in the process. While he may is always equated with evil, belonging to the Dark Side, we cannot help but admire Darth Vader’s highly enigmatic personality. Among the many characters of the diabolical Galactic Empire, no one has ever captured the imagination and fascination of sci-fi fanatics and loyal Star Wars followers as well as any other individual who may have seen any of the films from the franchise than Darth Vader. 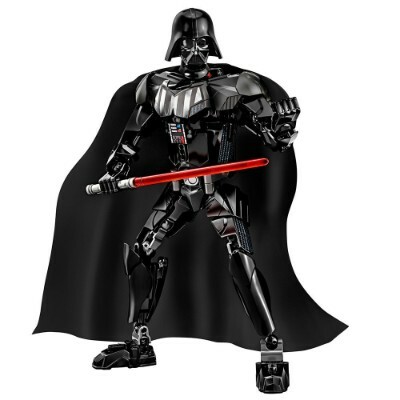 ven kids love this all-black dark knight with his signature red light saber and the iconic mask that has adorned many merchandise ever since the film’s release in the late 70s. That’s why if you give these kids the LEGO Star Wars Darth Vader Building Kit you will surely earn their admiration as well. 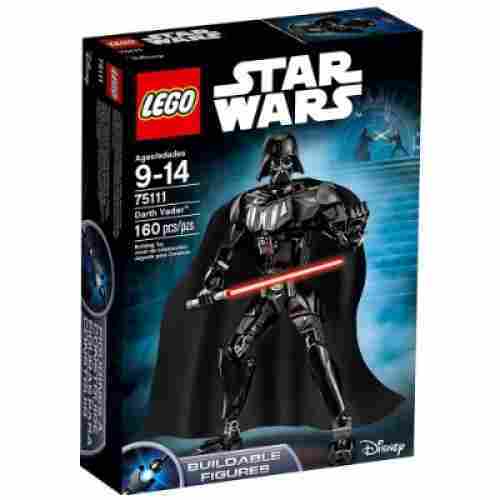 The Darth Vader model comes with a total of 160 building bricks complete with the different paraphernalia, armored suit, accessories, red light saber, and a black fabric cape that kids will need to morph their own Lord of the Dark Side. Once finished, Darth Vader stands 11 inches and should be quite a spectacle to behold especially if your child will try to determine the most appropriate pose for our dark lord. The limbs are all poseable so your kid can actually create fantastic poses to relive certain scenes in the first installment of the film franchise. The Darth Vadar Building Kit invites role playing and enhances problem solving skills for older children in the 9 to 14 year-old range. Once assembled, this model will entertain for hours on end any Star Wars fan with its moveable and posable limbs and accessories. The kit includes a black armored suit, black cape, and a lighted saber for the imagination to recreate many scenes from the Star Wars episodes. When this LEGO set is fully assembled, your child will have a great model to display in many realistic poses. Building bricks are exceptional at developing problem solving abilities among children. 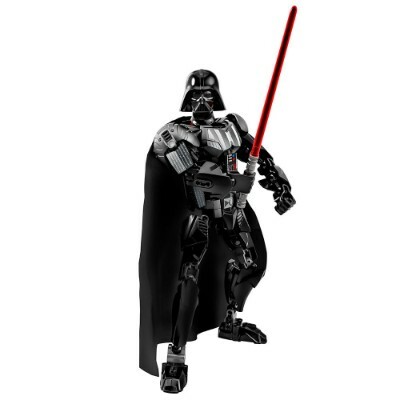 With the LEGO Darth Vader Kit, your kid can also enhance his or her role playing and imaginative abilities. Put down the phones and the remote and bring your family together for an intergalactic twist on this classic group game. Hasbro has reimagined the pop culture icon that is Bop It. 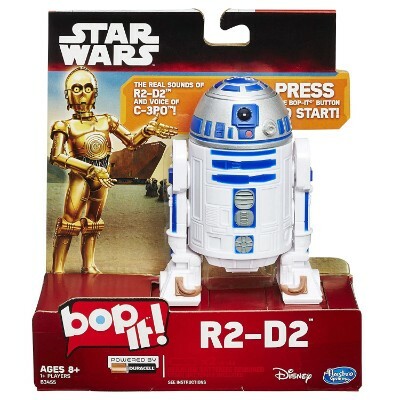 Now you can bop it, twist it, pull it, and pass it with R2-D2! C-3PO instructs players on which function they’re meant to perform. The game can be played solo, or with friends. There’s no limit to how many players can be involved since everyone gets a turn. Participants stand or sit in a circle and take turns bopping, twisting, and pulling various levers on R2-D2 in time with C-3PO’s instructions. When they’re prompted, they pass it, and the game speeds up. This continues until someone either misses a command or executes the wrong instruction. The product requires two AAA batteries and has two volume levels, so you can adjust how noisy the fun gets. R2-D2 even cheers fans on in his signature droid language! This game tests your family’s reflexes. Children and adults alike must practice careful focus and listening, while executing their commands in a timely manner. If you’re too slow or perform the wrong instruction, the game is over and it’s back to level one. Single-player and multi-player modes make this a versatile purchase. Kids can fly solo or play in groups; they’re free to enjoy the game no matter what. Much like the fan favoriteR2-D2, this trusty droid is known as BB-8. He’s part of the new Star Wars films that your child will immediately recognize from his funny antics in the movies. 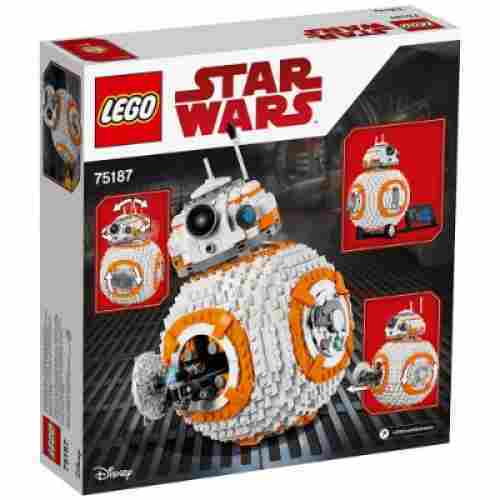 What better way than to give your child the gift of being able to build their own BB-8. This droid is extremely detailed making it roughly an exact replica from the droid in the movie. It turns and opens and closes much like the droid features in the films. It does come with a display stand which will be perfect to be placed on anywhere in the house your child desires. What a great toy for a kid that loves building and Star Wars. The blocks that come in this set create a challenge that everyone loves. From opening the packaging to sorting the blocks to putting the final piece together to create the figure. That is a great building block set that features an interactive design that has a rotating head and opening hatch. The stand that comes along with it makes it a great show piece once completed. We love this product because it’s perfect for any lego lover and perfect to help boost any creativity in your child and the design is extremely realistic. 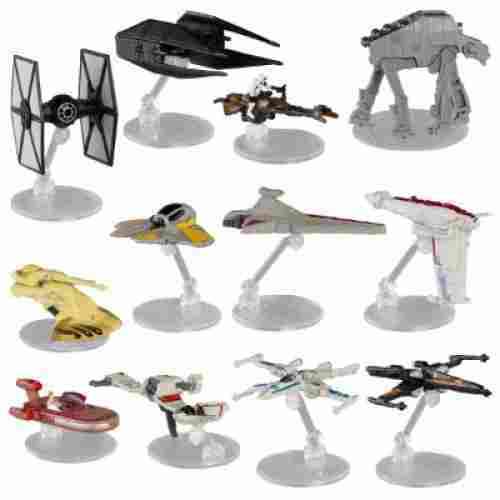 Race your pods, X-Wing Starfighters, and the Millennium Falcon with this awesome twelve pack from Hot Wheels. All spaceships are made from Hot Wheels’ signature high-quality die-cast metal. All models are crafted with careful details to imitate their movie counterparts. 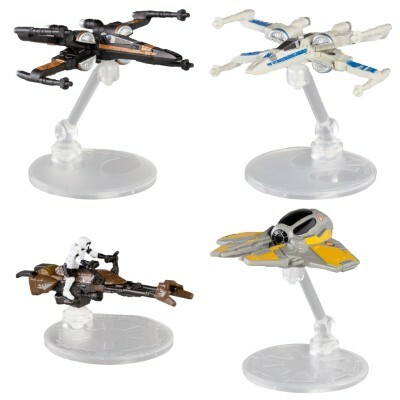 In this multipack, you’ll get three Partisan X-Wing Fighters, Poe’s X-Wing Fighter, a U-Wing Fighter, The Ghost, a Mandalorian Talon Fighter, the Millennium Falcon, a Slave I, Tie Fighter, First Order Tie Fighter, and the Tie Advanced X1. 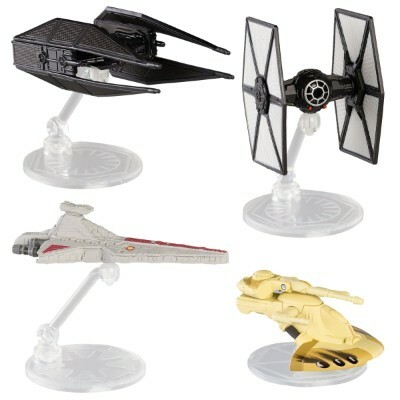 The ships are compatible with other Hot Wheels Star Wars sets, including the specially sized figurines and fighter pilots to fly all your favorite pieces. Each piece comes individually packaged and includes a flight stand for display and simulated flight, and each stand has a symbol so even amateur Star Wars enthusiasts can tell the good guys and the bad guys apart. The pack is recommended for ages four and up. Hot Wheels allow children the freedom of creative play while also making construction and building-centric toys fun and easy to operate. Race your spaceships across the galaxy with compatible tracks and Star Wars sets. Kids will have fun creating awesome space adventures for themselves and their friends. Crossing fandoms can exponentially raise kids’ excitement. Hot Wheels meets Star Wars in this varied set of classic spaceships modeled after the books and movies. In the first 6 films of the franchise, a lot of people fell in love with R2D2, the trusted droid of first, Anakin Skywalker, and then Luke Skywalker. In the 7th film of Star Wars, The Force Awakens, the entire galaxy was introduced to BB-8, another droid but with a very different mechanism for moving around. Instead of having tracked legs for mobility, the entire torso of BB-8 moves like a ball, enabling it to seamlessly move across any terrain. It’s no wonder that there’s a new darling in the Star Wars Universe. 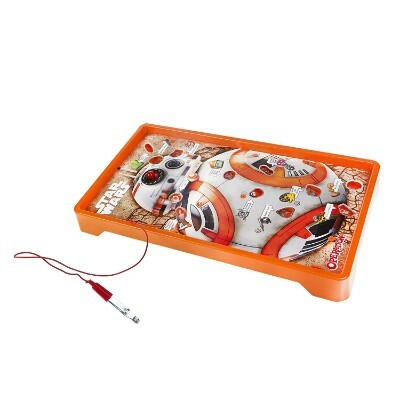 With the Sphero Star Wars BB-8 Droid your kids can now have their very own BB-8 in remarkable detail. Best of all, this is not just any toy that your kid will be playing with or will be displaying in his or her cabinet. This is a toy that will provide you endless fun. 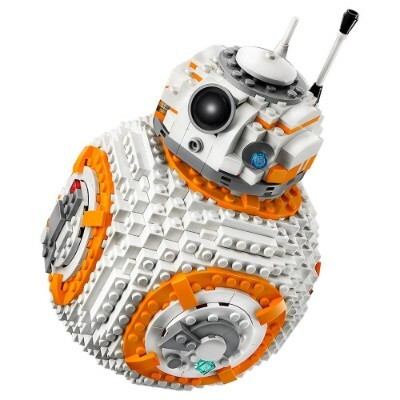 To obtain BB-8’s full functionality you will have to download the corresponding app on your iOS or Android device, install it, and use it to command and control BB-8. 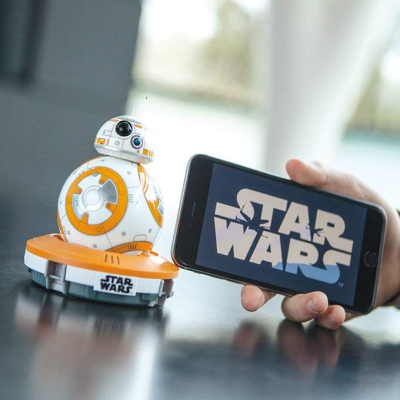 Drive BB-8 around like a remote control car or set it to go on “patrol” so it will start scouring the rest of your room or even your house. Or, you can record a message and have this played directly on your device. There are quite a few issues, though. Some feel that the promotional video of Sphero’s BB-8 is severely misleading. 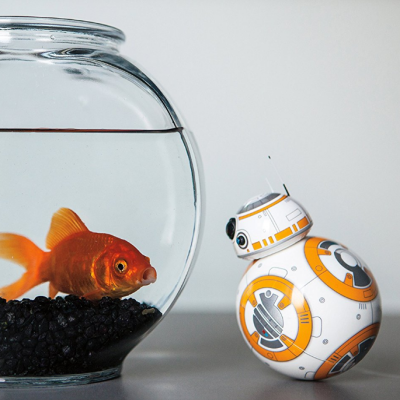 Some are made to believe that BB-8 has an adaptive AI personality, meaning it will continuously learn its surroundings, enabling it to adapt so it can solve obstacles. Unfortunately, BB-8 does bump into things. And when it does, it simply wobbles and “looks” for another path. Perhaps this is what Sphero had in mind when it said BB-8 has an adaptive personality. Another gripe is the published holographic capabilities of the Sphero BB-8. Instead of the messages projected by BB-8 itself, the messages are played on your device where you have installed the app. BB-8 is also able to respond to verbal commands just like Siri. Unfortunately, for now, it only works for iOS devices. Nevertheless, looking at the brighter side of things, BB-8 is definitely a revolutionary toy that kids and adults alike are sure to enjoy. We’re pretty sure Sphero will be coming up with the much needed updates to fix these bugs. Manipulated by an app, this extraordinary toy is a child’s commanding dream. By taking charge of the BB-8, your child can control it by voice command to scout around and exhibit expressions which will delight. 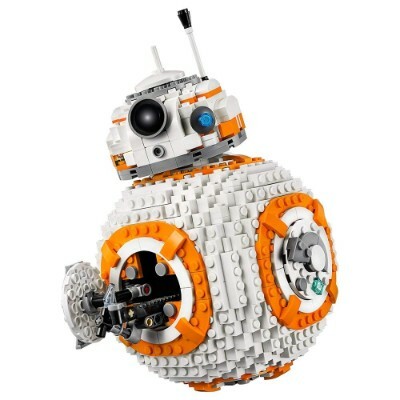 Without the voice commands, the BB-8 will explore its surroundings on its own and change course when it runs into obstacles. 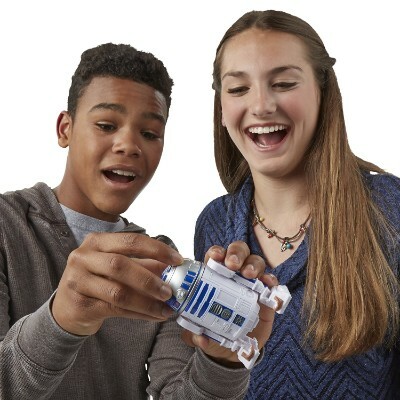 This super cute Star Wars Droid will surely become a great companion toy for children of all ages! The remarkable detailing of BB-8 coupled with its exceptional programming, despite a few setbacks, make it one of the best Star Wars toys to have. It may not really be the kind of toy you’re looking for but the Star Wars Chewbacca Pillow Buddy can provide lasting comfort for any child, thanks to its soft and plush design. The Chewie Pillow Buddy is made of quality polyester giving it a certain smoothness that will never irritate the skin. So, even if your kids will be hugging Chewie all night long, they will never wake up to itchy, blotchy, or even reddish skin. It can also double as a security pillow especially for children who may have to spend several nights away from the comforts of their respective beds. With Chewie providing the comfort that kids need, sleep comes a lot faster and easier, too. Sometimes just having something from your favorite movie is a comfort and this pillow buddy Chewbacca might be the toy to provide that comfort to your child. It’s super soft and cuddly and very much like we’d imagine Chewbacca to be, it’s also furry and plushie! It will make a great addition to any child’s room and will turn into a friend they can go to when they’re in need of serious cuddle time before bed. The Chewbacca Pillow Buddy is the perfect companion for any kids either for play or for naptime purposes. Thinking of helping your kid set up his or her own diorama of a favorite scene from the film The Force Awakens? If that’s the case, we strongly suggest getting the Official Disney Star Wars The Force Awakens 10 Deluxe Figurine Playset. You get 10 of the most iconic characters in the film in their amazing poses. You’ll love KyloRen’s striking stance or even Rey’s proud stand. There’s even Captain Phasma with her cape beautifully hanging on one shoulder while the ever-reliable Chewbacca is ready with his bowcaster. You also have a Stormtrooper with its ready-to-fire stance, Poe Dameron’s confident look, General Leia Organa’s regal posture, Finn and BB-8’s not-so-ordinary pose, and Han Solo’s signature “I’m-gonna-save-the-universe-again” look. The figurines come with remarkable detail with the tallest being 4 inches in height. It’s the perfect play set for reliving many of the action scenes in the movie. And once done, you can always build a diorama of sorts. 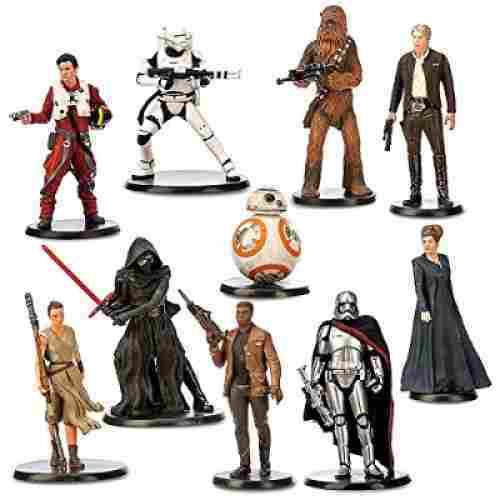 This 10 piece figurine set of the main Star Wars characters can really make your child’s imagination come to life as he/she recreates their favorite scenes from the Star Wars films. Providing hours of play with make believe situations which can entertain children of ages from three years and older. These figurines can also be used for displays in children’s rooms and anywhere that you would need these characters to stand freely as they each have a base for stability. A wonderful value as a Star Wars set! The exceptional details put into each character of the The Force Awakens Deluxe Figurine Set is simply amazing. There’s no reason for why you can’t have your cake and eat it too! 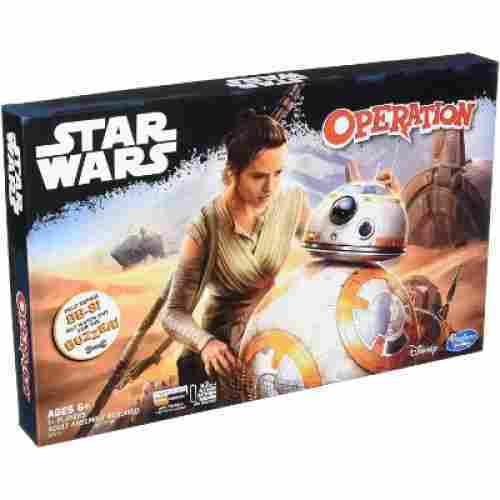 This Star Wars collector’s edition of the popular game Operation is perfect for lovers of both Star Wars and board games. Hilariously enough, the “operation” isn’t on a human being at all; instead, your kids will be doing their best to not accidentally BUZZ while taking out all of BB-8’s robotic parts. The setup is exactly the same and your kids will have an absolute blast attempting to wiggle BB-8’s gears out of his tiny robot body without that inevitable jump-scare that comes with bumping metal to metal. Operation is a great game for the entire family and this will undoubtedly jazz up your game nights! This game is a classic and will forever be a collector’s item on your shelf. Leave it to BB-8 to end up next on the operating table -- True Star Wars fans unite, quick, it’s a mad rush to save him after he was rescued on Jakku! This game comes with all of the traditional features that made Operation so much fun in the first place. With the fun twist of Star Wars, it’s more fun and laughs than actual competition and skill -- Which makes it the perfect board game to bring out on game nights or for after-school fun. 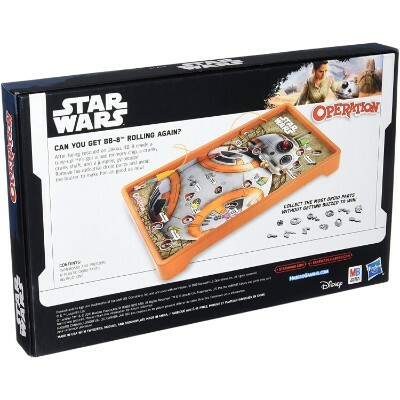 Star Wars Operation makes for a great gift to a child of any age. Kids and adults alike will get a serious kick out of this game and it’s perfect for any holiday, you can’t go wrong with a classic that’s still so popular today. Whether you’re a Jedi apprentice or a Sith follower, you will definitely need a working lightsaber to defeat your opponents. In many role playing activities of kids, the lightsaber is often in the form of sticks which kids have to make believe as powerful sabers. 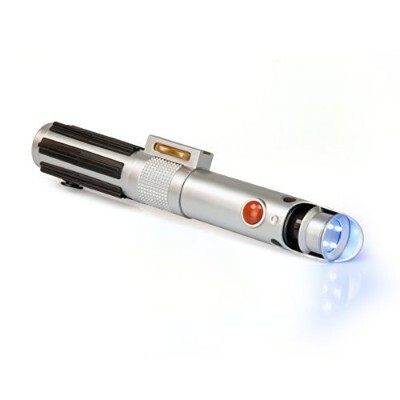 Now, they don’t have to strain their imaginations as the Star Wars Lightsaber Flashlight is here complete with the signature electrifying sound effects of the lightsaber. 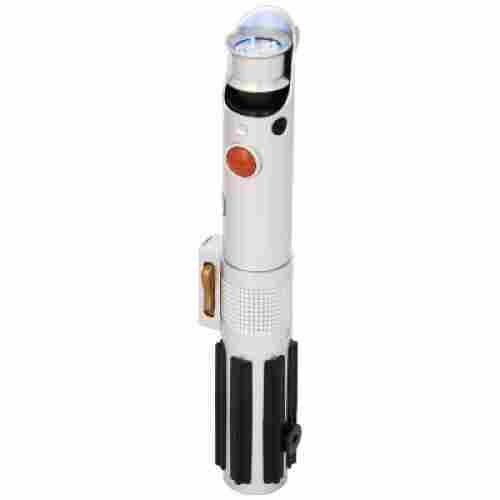 However, since the Lightsaber Flashlight doesn’t have the tubular “lightsaber” component like in other products, your kid will still have to use his or her imagination in projecting the likeness of the lightsaber. With blue LED lights and a darkened room, this should come really easy. Although this lightsaber does not in fact produce light as it would with real lights in it, the Star Wars Lightsaber was built with the safety of smaller children in mind. It does produce light in more darker situations with its blue LED lights, which will enthrall smaller children in their role playing. The sound effects increase the excitement of the toy, plus it is lightweight for active use. 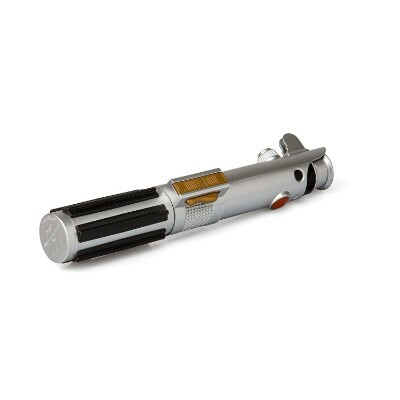 This durable Star Wars Lightsaber will make a great addition to the collection of Star Wars fans anywhere. It’s a great prop for pretend play and role playing activities as well as in costume parties. Most of the items on our list were chosen very carefully. We wanted every child to be able to enjoy these characters so most of our items can be used by children of the ages of three and older. Of course, some toys on our list do have smaller removable parts and are appropriately marked for much older children due to choking hazards. Children of the ages four and older can utilize and enjoy almost any of the toys listed above. It’s extremely important for parents to make sure however that they are purchasing a toy that is suitable and age appropriate for their child because of hazards with small parts. Smaller children cannot put together these small figures on their own and would not be able to enjoy these specific toys as much because they will need help playing with the toys each time. The endurance of toys is very important, especially with the action figure toys since they can be used in a role-playing atmosphere for children. These toys will take great abuse with repeated use and rough handling by boys and girls of any age. Toys chosen for this review are all made of durable materials and will be able to withstand a lot of rough and tumble play for many many hours of enjoyment and years. Most of the items on our list are made of plastic which can be easily cleaned or in the case of the Chewbacca pillow with it’s soft fur material, can be easily machine washed. Details of the figures and each playset on our list were also considered when reviewing these items. It’s extremely important for the quality of the play if the toys are real to life of the characters that your children see in the movies that they enjoy and want to reenact scenes from or create their own storylines as well. 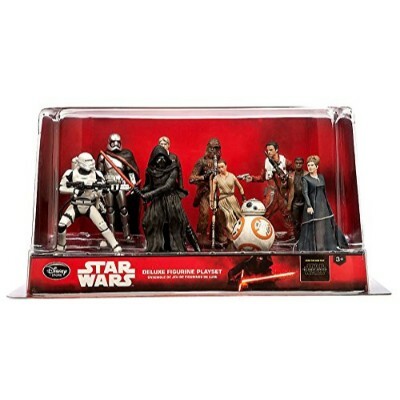 Your child will get excited to see and play with their favorite characters from any of the Star Wars films. The more the toys look like the real characters, the more intense the playing can be with the toys that your child owns, increasing the value in child play and imaginative play. That Star Wars is an american franchise that is an epic space opera that was created and centered around George Lucas. It all started in 1977 and is focused around the Skywalker family. That playing with Star Wars toys is a great way to expand the creative play of your kids. When playing with open ended toys it allows their minds to explore the world around them and create the own scenes. The manufacturers of these Star Wars toys were realistic and true. The pictures presented on the toys on each website were accurate and overall consumers were satisfied with their purchases. All of these toys provide great value for the cost of the items. 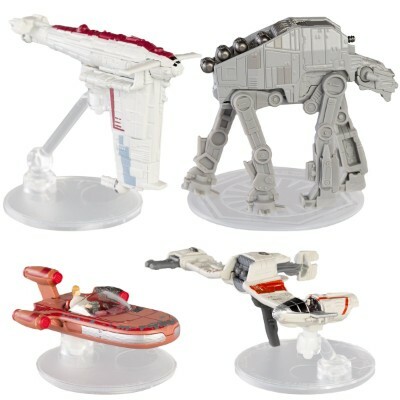 Any Star War fans will be delighted to have any of these toys as part of their collection. When choosing which toys from Star Wars would be considered the best for this year, we had to look at every obstacle and benefit that these types of play sets offered. Particularly in terms of development and growth of children of any age group. All toys, we believe, are built for the purpose of optimizing your child’s development. When identifying feature in each toy it’s also important to research the positive changes in a growing child as well as providing invaluable input in our search the customer feedbacks. We also took into consideration satisfaction ratings that somehow gave us an idea of how well-received these products are in today’s market. It is one thing to have to rely on product descriptions and all the marketing information that comes along with toy but it’s entirely different considering what others think of the toy itself regardless of how subjective these comments can be. We also had to consider safety extremely carefully considering that we were essentially focusing on items specifically designed for children. 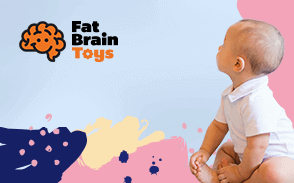 From the way the toys are built right down to the very materials that were used we took everything about the toy, and it’s features into consideration to make sure that it was 100% safe for your child to enjoy. 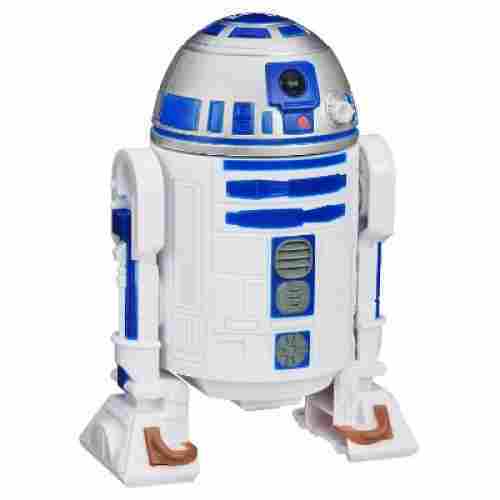 Star Wars toys are excellent toys for encouraging your children to use their imagination through pretend play. Essentially you are given your children the right tools to improve their cognitive, language, social and self-control skills. With these 10 toys above on our list you will find one that is perfect for them, you might even come across their favorite character. q: Does the Chewbacca Mask fit over eyeglasses when worn? No, it will not fit over eyeglasses. The mask is specially fitted to accommodate smaller faces because of the chin mechanism that operates the roaring sounds it makes. Because of this form-fitting, the inside section will not allow eyeglasses to be worn with it. q: Does the saber in the Darth Vader Building Set really light up? 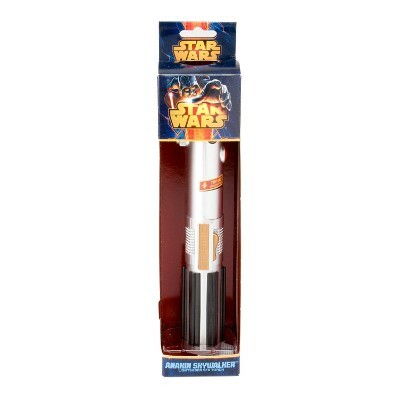 No, the saber does not light up as you would think because of the package wording. q: How long does it take to assemble the Darth Vader Building Set? It takes about one hour for a child of 7 years or older to assemble properly. q: Does the BB-8 Droid work on carpets? This depends on the carpet type. If it is a plush-type carpet, then the toy will move very slowly. However, the promoters do state that it can move even on carpets. q: I purchased the BB-8 Droid and downloaded the app to my phone. I do not hear the sounds when the toy is in use, but they seem to come from the phone. Do the sounds come from the toy or the downloaded app on the phone? Unfortunately and disappointedly the sounds for the toy come from the phone. This means that if the phone and the toy are not in close proximity to each other, then the full excitement of the sound mechanism cannot be enjoyed. q: Is the Chewbacca Pillow Buddy safe for children under the age of 3 years old? Yes it is safe for young children because there are no removable parts and the toy is soft and made of plush material. Makes a very good companion huggy friend.